For hundreds of years the Martial Arts were taught secretively, to a select few individuals, through temples, in families handed down from generation to generation, or by invitation. Only individuals of the most trusted character were allowed to study. Today the study of Martial Arts has been opened to everyone and has become one of the most popular individual participation programs in this country with thousands of active students in hundreds of clubs and schools. Our school teaches a traditional Okinawan style of karate called "Shorin-Ryu" or "small forest style". The patch displayed above to signify our style was designed by Hanshi Nakazato, 10th Dan and Grand Master or our style of karate. The larger Japanese words say Shorin Kan, the smaller ones say Shorin Ryu. 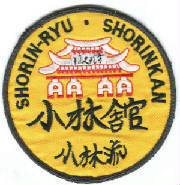 Shorin Kan means academies of Shorin or dojos belonging to that style. The little house type design is called "The Shurei Mon (gate) This is the second of six gates of the Shurei Castle. The Dojo is a place set aside in dedication to the study of the Martial Arts. When you enter you leave behind the strife and stress of your life and give yourself wholeheartedly and completely to your training. When you leave the Dojo you may find it easier to shoulder the burden you left at the doorway, or, you may find it really wasn't worth the worry you were giving it. Always enter the Dojo with respect in your heart for all others who train here. Respect your Sensei for the knowledge that is being passed on. Respect those who have attained a higher level. Respect their dedication but do not envy them. Respect those who have not yet achieved what you have achieved. Respect them for their efforts and remember that you were once as they. Everyone who enters our Dojo is subject to the rules and courtesies observed here no matter who they are or what their rank is. We are a Black Belt School. We train by the principles handed down from generation to generation and from Dojo to Dojo: Modesty, Courtesy, Integrity, Perseverance, Self-Control and Unyielding Spirit.